CAMINA EL AUTOR: Juancho's travels in Peru: "Perú visits Peru"
At the end of March, Perú launched a new "country brand" with a logo for Peruvian products. Incorporating a spiral into the P the logo gives a nod to Perú's ancient past, and cultures such as Nasca and Caral. Modern inhabitants may be reminded of the final part of the old AeroPerú logograph. 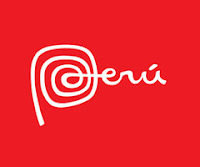 As part of the campaign to get Peruvians to adopt and use the logo, the company hired to produce and promote the brand sent a delegation of Peruvian "ambassadors" headed by chef Gastón Acurio to share Peruvian culture with the 569 inhabitants of Peru. Confused? Watch the video and all will be explained!